ATTENTION CITIZENS OF THE WORLD: Unite or else! Recycle! Reduce your carbon footprint! Try to avoid exhaling as much, and flush minimally. And use one square of toilet paper. Compost. And you better embrace” flubber and pixie dust” as alternative energy sources (that’s what my friend Chris Horner calls it). The beat goes on. I was in Washington, DC last weekend. It was another whirlwind trip, like usual. I never stay more than about three nights in fear that I could “grow” into thinking like Ruth Bader Ginsberg and company. It’s a good idea to keep getting out of DC and re-connecting with the real world. An unexpected bonus was seeing the aftermath of last Saturday’s pre-Earth Day rally on the National Mall. Wandering around the monuments the day after the celebration, the residue from all of the climate-hype-true-believers was everywhere, from a sea of porta potties waiting to be hauled off to a mystery location, to truckloads of trash, all neatly recycled. Hospitality tents, left over rally props; you name it, all stacked and ready to be stored until next time. 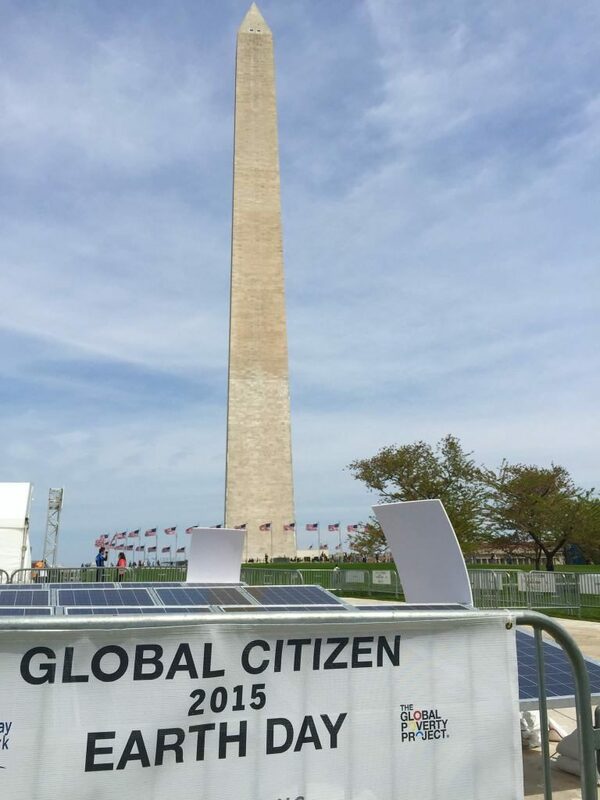 One banner stood out, with its bold letters and message: “GLOBAL CITIZEN 2015”. It sent a bit of a chill down my spine, as that sounded a bit Orwellian. Yet I was encouraged by the fact that I still could see the Washington Monument and numerous American flags proudly flying in the distance. A reminder that sanity was still around us. I took a photo, posted on Facebook and added the caption, “No, actually I’m a CITIZEN of the UNITED STATES of AMERICA”. There was one beautiful benefit in my visit to the “remnants of Earth Day” however. My delay there, taking photos and using social media, created a surprise connection. Realizing I was about out of time for my visit before needing to head to the airport, I decided to walk across the street to the World War II Memorial. Just then, sirens and a mini motorcade… cops in front and back of a big bus. Inside were several World War II Veterans, most in their late 80s and into the 90s, many seeing the Memorial for the first and last time. It was an HONOR FLIGHT group from New England. I stood, silently, watching them slowly get into wheelchairs, ready to pay tribute to the Greatest Generation. I thanked as many I could before feeling emotionally overwhelmed. A few other passersby did the same thing, though most people had no clue and paid them no respect. Thank God for those men, and their fellow soldiers. They laid it on the line for liberty, and our freedom to be Americans… including the right to free speech… or ignorance and disdain… or the ability to put on loopy displays of political correctness.